Historical time line outlining the histories of the Vancouver and Okanagan campuses. (UBC-V) What is now the site of UBC-Vancouver’s Point Grey campus is inhabited by Coast Salish peoples, in particular the Musqueam First Nation. Point Grey is known as ?əlqsən (Ulksun). Other Musqueam place-names around the campus can be found using the Musqueam History Web Map. The Squamish and Tsleil-Waututh First Nations also make use of the land and its resources. (UBC-O) The future site of UBC-Okanagan’s Kelowna campus is inhabited by the Syilx (Okanagan) Peoples. 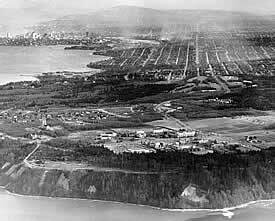 Point Grey established by British government as a Colonial Admiralty reserve – presumably for strategic reasons relating to protecting English Bay and the Fraser River estuary. Initial proposal for a provincial university made by Superintendent of Education John Jessop, only six years after British Columbia joined Canada, with the total population still less than 50,000. An Act Respecting the University of British Columbia passed by the provincial legislature. However, the political rivalry between Vancouver Island and the mainland leads to a dispute about where the university should be located. The first meeting of the new university’s senate in Victoria (Vancouver Island) fails to reach quorum when some members from the mainland fail to attend. A second meeting is never held, and the Act is allowed to lapse. South Vancouver District Municipality established, enclosing all the lands up to and including the western extremity of Point Grey “along the low water mark” of English Bay and the Fraser River. Vancouver High School establishes Vancouver College, affiliated with Montreal’s McGill University. Vancouver College is taken over by McGill and renamed McGill University College of British Columbia. McGill University College offers only two-year programmes in arts and sciences; students still have to go elsewhere to complete their degrees. University Endowment Act provides for the funding of a provincial university through the sale of up to two million acres of Crown land in central and northern British Columbia. Point Grey Municipality created by carving away all land west of what is now Cambie Street formerly part of South Vancouver. Provincial legislature passes a new University Act establishing the University of British Columbia. It provides for a Chancellor, a Convocation, a President, a Board of Governors to manage the University’s administrative, property, and business affairs, and a Senate to administer academic matters. Convocation is initially to include all graduates of British or Canadian universities resident in the province, plus 25 members chosen by the provincial government; after its first meeting, it is to consist of members of the first Convocation, plus members of Senate and all graduates of the University. The Act also declares the University to be non-sectarian and co-educational. 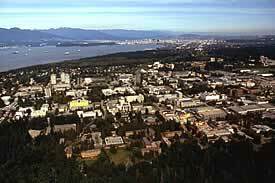 After a province-wide survey, Point Grey is selected as the site of the UBC campus. The provincial government reserves 175 acres of Crown land, within the boundaries of the Municipality of Point Grey, for the University’s future home. First meeting of Convocation. Election of Dr. Francis Carter-Cotton, head of MUCBC, as first Chancellor. “Bowser-Hughes Agreement”: Dominion government agrees to cede all “right, title, and interest” in the Point Grey reserve established in the 1860s (see above) to the provincial government, in exchange for the right to build a drill hall and parade ground, a wireless station, and a coastal artillery battery. This clears the way for the UBC campus to be built on the site. Dr. Frank Fairchild Wesbrook appointed first President of UBC. Architectural firm of Sharp and Thompson (later Thompson, Berwick, Pratt and Partners) appointed University Architects, after winning a campus planning and design competition. Construction of first permanent buildings at Point Grey begins. Outbreak of First World War halts work the next year, with only land-clearance and the frame of the Science Building completed. Librarian J.T. Gerould from the University of Minnesota, hired to purchase books in Europe, is arrested as a spy in Leipzig, Germany when war breaks out; the incriminating “evidence” includes a copy of the UBC site plan in his baggage. University of British Columbia opens in temporary headquarters at the former McGill University College facilities adjacent to Vancouver General Hospital (nicknamed the Fairview “shacks” after the surrounding neighbourhood). There are three faculties: Arts, Applied Science, and Agriculture. Student enrolment in September is 379. Full- and part-time faculty number 34. Alma Mater Society (student union) formed. Military training included in curriculum for duration of the war. By the end of the First World War, 697 students would see active military service – 78 would be killed in action. John Ridington appointed first University Librarian. President Wesbrook dies, and is succeeded the following year by Dean of Agriculture Dr. Leonard S. Klinck. The return of students from war-time duty increases enrolment to 890 for 1919-20. The “shacks” quickly become over-crowded, with classes being held in tents, churches, and Sunday schools; however, construction at Point Grey is not resumed. The University offers first degree programme in nursing in the British Empire. Victoria College opens in affiliation with UBC. The University imposes first tuition fees of $40 per year. University Endowment Act amended: rights to Crown lands in the interior exchanged for 3000 acres adjacent to the Point Grey campus site, which are intended for sale as residential properties. These become known generally as the “University Endowment Lands”. Tired of over-crowded conditions (full-time enrolment reaches 1200 for 1921-22), students organize province-wide publicity campaign to persuade the government to complete the Point Grey campus. The “Build the University” campaign climaxes in a parade (“The Pilgrimage”, later known as “The Great Trek”) from downtown Vancouver to Point Grey, and the presentation of a petition with 56,000 signatures to the Speaker of the Legislature in Victoria. The government authorizes a $1.5 million loan to resume construction. The campaign marks the beginning of active student involvement in the University’s development. 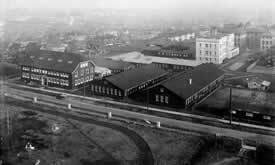 Government lets contracts for completion of Point Grey buildings: the Science building (today part of the Chemistry building), the Library, a power plant, and nine “semi-permanent” buildings (Arts, Agriculture, Applied Science, Administration, the Auditorium, and four laboratory/workshop buildings, most of which are still in use today). In the wake of disputes between the provincial government and the Municipality of Point Grey about how to pay for roads, sewers, and other infrastructure for the UBC campus site, the University Hill residential area, and the University Endowment Lands, the province removes those lands from the municipality’s jurisdiction. The area thereafter would be administered directly by the province. UBC opens its Point Grey campus. As part of the inauguration ceremonies, the University holds a special Congregation to award its first honorary degrees. The Musqueam nation agrees to sell their sole surviving house posts to the UBC Alumni Association on the condition that they would be placed on the Point Grey campus next to the Musqueam reserve. The Alumni Association presents the University with the house posts during the second annual Homecoming. This marked the beginning of UBC’s collection of totem poles and other large scale First Nations carvings, and also helped remind visitors to UBC of the continuing presence of the Musqueam people on lands they had occupied for centuries. The house posts are now located at UBC’s Museum of Anthropology. The first Gymnasium, built with funds raised by students, is presented to the University. Municipalities of Point Grey and South Vancouver amalgamate with City of Vancouver. The UBC campus and the University Endowment Lands remain outside the city’s boundaries. According to a UBC student census, there are 1,904 students registered: 1,714 “British” (Canadian citizenship did not exist until 1947), 72 Americans, 21 Japanese, 16 Hebrew, 6 Chinese, and 4 East Indians. Great Depression forces reduction in University operating grants by provincial government. Students mount successful publicity campaign against a suggestion that the University be closed; however, the budget is reduced from $626,000 to $250,000 and salaries are reduced. The resulting disputes between President Klinck, the Board, and the Senate eventually lead to amendments to the University Act in 1935 which re-organizes the University government. UBC athletic teams adopt the nickname “Thunderbirds”. Establishment of Department of University Extension (today’s Continuing Studies), which provides post-secondary education around the province and year-round. Students contribute funds toward construction of UBC Stadium. Registration in campus C.O.T.C. (Canadian Officer Training Corps) unit doubles as Second World War begins. A total of 1680 students would eventually enlist in the armed services. Of that total, 169 would “make the ultimate sacrifice”, including R. Hampton “Hammy” Gray, posthumously awarded the Victoria Cross. Students contribute to the construction of the first student union building, Brock Hall. Students waive army pay to help construct Armoury. Campus army unit reaches maximum strength of 1879, and many faculty members are on leave for special war-time duty. Federal government funding for defence and other research purposes increases. Seventy-six Japanese-Canadian UBC students were forcibly removed and exiled from the B.C. coast in 1942, when the Canadian government implemented internment as part of its policy after Canada’s declaration of war on Japan. Few students were able to complete their studies after the war because their family or financial circumstances no longer made this possible; others ended up at universities in eastern Canada. Dr. Norman A.M. MacKenzie appointed UBC’s third President. First student residences opened at Acadia and Fort Camps. University begins a period of post-war academic expansion by inaugurating the Faculty of Law, and establishing new programmes in social work, pharmacy, home economics, and physical education. 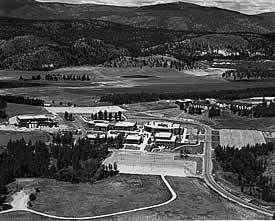 To accomodate the new programmes and expanding enrolment, fifteen abandoned army and air force camps are dismantled and shipped to Point Grey, where the huts serve as classrooms, laboratories, and residences for both students and faculty. A few are still in use today, mainly for storage purposes. Enrolment swells to 9374, with war veterans making up some 50 percent. Postwar construction would add more than twenty new buildings by 1951, including facilities for physics, engineering, and biological sciences, as well as the Library’s north wing. Opening of the first Faculty Club, in a surplus army hut originally used as an officers’ mess. Van de Graff atomic generator installed in Hennings (Physics) Building – one of many government-supported post-war research initiatives. During half-time at the UBC Homecoming football game, Chief William Scow, on behalf of the Kwicksutaineuk people, officially sanctioned the use of the name “Thunderbird” for the University’s athletic teams and facilities. During the ceremony, native carvers Ellen and Ted Neal presented a twenty-two foot totem pole which served to sanctify the occasion. Faculties of Pharmacy and Medicine established. Faculty of Graduate Studies established to administer masters and Ph.D. programmes. First Museum of Anthropology opened in the basement of the Library. Schools of Commerce and Education established. Student initiative leads to construction of War Memorial Gymnasium, as a memorial to British Columbia’s war dead. Mounted in the gymnasium are plaques of the University’s “honour rolls” – lists of students who lost their lives in the two World Wars. Faculty of Forestry – formerly a department in Applied Science – established, along with the School of Nursing. British Empire Games swimming and diving events held at newly-constructed pool adjacent to War Memorial Gymnasium. Brock Hall partially destroyed by fire. Restoration funded by donations from students and alumni. Construction of Buchanan Building for Faculty of Arts and Science begins. Schools of Commerce and Education promoted to Faculty status. UBC incorporates the Sopron School of Forestry from Hungary, after students and faculty flee their homeland in the wake of the failed anti-Soviet revolution of 1956. They formed the Sopron Division of the Faculty of Forestry, with their own curriculum taught primarily in Hungarian. University celebrates its “Golden Jubilee” (fifty years since the passing of the University Act) and launches the “UBC Development Fund”, the first public appeal for capital funds by any Canadian university. Fund drive and government contributions together raise $35 million. International House, a meeting place for UBC students from outside Canada, officially opened by Eleanor Roosevelt. Opening of new Faculty Club and University Social Centre, donated by Leon and Thea Koerner. Construction of the Library’s south wing, made possible by a substantial gift from Walter C. Koerner, completed, housing an undergraduate library (later named the Sedgewick Library, after former English Department head and Shakespearean scholar Garnett G. Sedgewick) and a Special Collections Division. Dr. William Holland arrives to head the new Department of Asian Studies, bringing with him the library and records of the Institute of Pacific Relations, which had closed its New York office in the wake of allegations of Communist influence. Schools of Librarianship and Rehabilitation Medicine open. Alfred J. Scow becomes the first Aboriginal student to graduate from the UBC Faculty of Law. He later becomes the first Aboriginal lawyer called to the B.C. bar, and the first legally-trained Aboriginal judge appointed to the B.C. Provincial Court. Dr. John B. Macdonald becomes UBC’s fourth President. Report by President Macdonald on the future of higher education in British Columbia. A new university and a network of community colleges are among the recommendations. Provincial government passes new Universities Act, which provides for the incorporation of the University of Victoria (formerly Victoria College) and Simon Fraser University. A gift of $3.5 million by Dr. P.A. Woodward assures continuing development of UBC’s Health Sciences Centre, including classroom facilities, a bio-medical library, and a hospital. Faculty of Arts and Science splits. First class enrols in new Faculty of Dentistry. Forestry magnate H.R. MacMillan gives $3 million to expand Library book collection. This coincides with the decentralization of Library system, eventually leading to establishment of thirteen branch libraries around the campus and elsewhere in Vancouver, housing over three million books. University begins largest expansion programme in its history, building South Campus research area. (UBC-O) Based on the recommendations of the Macdonald Report, Okanagan College opens its first campus in Kelowna. Other campuses would later be established in Penticton, Vernon, and Salmon Arm. First four students elected to University Senate. “Yorkeen” mansion, at north end of campus, purchased by Cecil Green (former UBC student and co-founder of Texas Instruments) and donated to the University. Renamed Cecil Green Park House, today it houses the University’s Development Office and the UBC Alumni Association. New Student Union Building (SUB) completed. Brock Hall turned over to student services and administration. American “Yippie” leader Jerry Rubin leads student sit-in at UBC Faculty Club. Occupation ends without violence 22 hours later. (UBC-O) Okanagan College begins offering university transfer courses. Popular University alumnus, mathematics professor, and administrator Dr. Walter H. Gage appointed President. UBC enrolment numbers 20,936 students. UBC becomes first university in Canada to offer Women’s Studies programme for academic credit. UBC Senate adopts report advocating new emphasis on opportunities for part-time degree study. Sedgewick Undergraduate Library moves to underground facilities west of Main Library. Investment in UBC buildings from 1915 to 1973 totals more than $173 million. Senate approves recommendations for election of 196 students as full voting members of UBC’s twelve faculties. Enrolment in credit and non-credit programmes at Point Grey and throughout British Columbia totals 66,508 students. Senate committee proposes priorities for 16 building projects, costing an estimated $35 million, for period 1975-1980. Tri-University Meson Facility (TRIUMF) opened in South Campus area, housing giant cyclotron used for research in nuclear and particle physics. Native Indian Teacher Education Program (NITEP) established at UBC. Former Dean of Arts Dr. Douglas T. Kenny appointed President of UBC. Opening of the new Museum of Anthropology, designed by famed Canadian architect Arthur Erickson. Partially funded by the Canadian government, the Museum features outstanding collections of Northwest Coast First Nations art. Establishment of Centre for Human Settlements at UBC, in connection with the United Nations Conference on Human Settlement (Habitat ’76) in Vancouver. UBC begins teacher education programme in Whitehorse, Yukon Territory. UBC awards its 100,000th degree. Final phase of Health Sciences Centre opens. The Koerner Pavilion, named for Walter C. Koerner, includes an Acute Care Hospital. Opening of Asian Centre, which houses the Department of Asian Studies and an Asian Library, and which is adjacent to the classical Japanese Nitobe Memorial Garden. Discovery Park UBC established in South Campus area, on land leased to the provincial government for use as a research facility. A University budget shortfall of $7.5 million, and provincial government’s refusal to provide additional funding, forces UBC to raise tuition fees an average of 32.8%, and consider cutting faculty and support staff. Student protests, including a campus-wide “day of mourning”, have little effect. Dr. K. George Pederson appointed President. Faced with continuing financial constraints, Senate votes to limit first-year enrolment for 1984-85, and the Board of Governors raises tuition fees an average of 33%. President Pederson resigns in protest against provincial government cuts in post-secondary funding. Dr. Robert H.T. Smith appointed President pro tem. Later in the year, Dr. David W. Strangway is named University President. Provincial government announces “Fund for Excellence In Education”, to be shared by all three provincial universities to support “Centres of Excellence” in certain areas of research and instruction. UBC Real Estate Corporation (now UBC Properties Trust) founded to develop the University’s real estate assets, for capital fund or endowment purposes. Its first project is Hampton Place, a residential development near the south end of campus. It would later plan and develop a series of residential neighbourhoods around the campus, collectively known as “University Town”. Computerized telephone course registration system, known as TELEREG, introduced. This replaces the on-campus “arena scheduling” system, which required students to physically walk across campus from department to department to register for courses. Launching of “The UBC Campaign”, with its theme “A World of Opportunity”. Its goal is to raise $66 million in private and corporate donations, with the provincial government to provide equal matching funds, to pay for new buildings, facilities, programmes, and scholarships. Overwhelmingly successful, by the time it ends in 1993 the campaign will have raised a total of $262 million. Pacific Spirit Regional Park created from undeveloped areas of University Endowment Lands. (UBC-O) UBC enters into partnership with Okanagan College and Cariboo College (Kamloops), allowing the Colleges to provide third- and fourth-year courses leading to degrees in Arts and Science. Similar arrangements are made between Okanagan College and the University of Victoria regarding courses in education and nursing. The first degrees under this arrangement would be granted by Okanagan College in the name of UBC in 1991. UBC celebrates the 75th anniversary of its opening with a series of special events, including the largest Open House in its history. Undergraduate and graduate enrolment for the 1992-93 academic year totals 30,579 students. Registration for non-credit courses exceeds 85,000. Full-time faculty number 1851, and support staff number 3774. Expenses for 1991-92 totalled $328,011,000, and funding for research (both grants and contracts) totalled $116,957,082. Release of a new Main Campus Plan, following those of 1959, 1968, and 1982. It is intended to direct the growth and evolution of the Point Grey campus to the year 2000 and beyond. Ritsumeikan House opens for students from UBC’s exchange programme with Ritsumeikan University in Kyoto, Japan. (UBC-O) To reflect its increasing role as a post-secondary institution, Okanagan College informally adopts the name “Okanagan University College” (OUC). The name change would be formalized by provincial legislation in 1995. U.S. President Bill Clinton and Russian President Boris Yeltsin meet at UBC during the “Vancouver Summit”. Opening of the First Nations Longhouse. Built of western red cedar, with a copper-clad roof, its design is based on that of a Coast Salish longhouse. It houses First Nations education programmes, counselling services, and cultural events, the offices of the First Nations House of Learning, and X̱wi7x̱wa Library, and generally serves as a “home away from home” for some 250 First Nations students attending UBC. Opening of Green College, a residential graduate college designed to foster an “interdisciplinary community” among visiting scholars and students. UBC biochemistry professor Michael Smith receives the Nobel Prize in Chemistry for his pioneering work in the development of “site directed mutagenesis”, a technique which allows gene sequences to be altered in a designated manner for use in medical and biological research. (UBC-O) OUC opens its main North Kelowna campus. Opening of C.K. Choi Building, for the Institute of Asian Research. Constructed largely of recycled materials (including timber beams from the demolished Armoury), it embodies the most advanced environmental design principles. (UBC-O) The provincial College and Institute Act grants OUC and other regional colleges the authority to grant undergraduate degrees in their own name. OUC would award its first such degrees in 1998. Undergraduate admissions policy revised by Senate, enabling faculties to use criteria such as leadership abilities and career-related work experience for admitting students directly from high school. Establishment of St. John’s College, a residential graduate college, and the Sing Tao School of Journalism announced. Both would officially open the following year. Completion of Walter C. Koerner Central Library, which combines Sedgewick Library with a new five-storey building. Dr. Martha C. Piper appointed UBC’s new President. The Asia-Pacific Economic Co-operation (APEC) Economic Leaders’ Meeting is hosted by the federal government at the UBC Museum of Anthropology. Approximately 1,500 protesters come to the campus to voice their concerns that APEC discussions aimed at liberalizing trade between participating countries would not include any reference to human rights and social and environmental issues. Clashes between protestors and police would lead to a number of legal actions and an official inquiry. The First Nations Languages Program is initiated as part of UBC’s commitment to community-based collaboration with First Nations peoples. First Annual General Meetings held – one in downtown Vancouver, the other on campus. The meetings are intended to inform both the University community and the general public about UBC’s goals for the future, key accomplishments of the past year, and its financial position. Board of Governors approves Trek 2000, a vision document presenting the University’s goals and principles for the 21st century, and identifying key targets and strategies to attain them. Faculty of Forestry moves from the Macmillan Building, which it had shared with Agricultural Sciences, to the Forest Sciences Centre. A fundraising campaign, providing opportunities to name certain facilities in the Forest Sciences Centre, attracted support from the B.C. forest industry, with UBC providing matching funds. Completion of Donald Rix Building, named after the UBC professor of pathology and entrepreneur who contributed to the cost of the building, and built to accommodate companies created on the basis of UBC research. There are 22 private companies located on campus. Most of these are UBC spin-offs, with the remainder having research relationships with the University. Profits from lease agreements with these companies are fed back into UBC research. 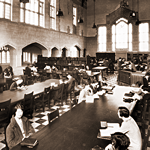 The Wallace B. Chung and Madeline H. Chung Collection and Reading Room opens in Main Library. Originally donated in 1999, the collection is considered a national treasure and valued in the millions of dollars. It consists of more than 25,000 items and focuses on the exploration of the Pacific Northwest, the Chinese experience in North America, the history of British Columbia, and the Canadian Pacific Railway Company. The First Nations Studies Programme is launched as an interdisciplinary undergraduate program in the Faculty of Arts. Opening of UBC at Robson Square, located in downtown Vancouver. Both credit and non-credit courses are taught at the new campus, primarily from Commerce and Continuing Studies. Public lectures in a broad range of cultural and community themes are also presented. UBC at Robson Square also houses the Women’s Resource Centre, as well as library and bookstore facilities. TELEREG course registration system eliminated in favour of an Internet-based system via the UBC Student Services website. UBC collaborates with Simon Fraser University, British Columbia Institute of Technology, and Emily Carr Institute of Art and Design to establish Great Northern Way Campus, on land donated by Finning International in the “False Creek Flats” area of Vancouver. GNWC is intended to provide an integrated environment for innovative education and research initiatives in the arts, digital media, and environmental technology. Completion of the Chapman Learning Commons in the 5th-floor concourse of the Main Library. The Commons features group study space, learning resources, and state-of-the-art computing and Internet facilities. Faculty of Commerce and Business Administration changes its name to Sauder School of Business, to honour a $20 million gift from forest industry leader and former UBC Chancellor William L. Sauder. Construction begins on the Irving K. Barber Learning Centre, to be built around the heritage core of Main Library. It is named for forest industry leader Irving K. “Ike” Barber, who donated $20 million for its construction (UBC and the provincial government provided matching funding), and is intended to house Library collections, academic programmes, and study spaces. Opening of the Michael Smith Laboratories, a $30-million biotechnology research facility at UBC Vancouver, housing the former UBC Biotechnology Laboratory and named after the Nobel Laureate who died in 2000. The totem pole presented to AMS in 1948 (see above), is restored from decay and vandalism, and re-dedicated as the “Victory Through Honour” pole at a public ceremony bringing together Musqueam, Kwakwakw’wakw, and UBC protocols. (UBC-O) Announcement of the merger of UBC and Okanagan University College in March 2004. 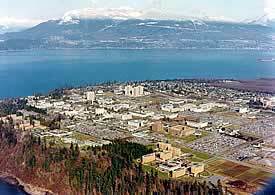 UBC Okanagan would open on the site of OUC’s North Kelowna campus in September 2005 – at the same time, other OUC campuses would be reorganized to form Okanagan College. (UBC-O) Board of Governors approves a $18.4 million construction plan for new student residences at UBC Okanagan. (UBC-O) Irving K. Barber provides $12.25 million endowment to establish UBC Okanagan’s Irving K. Barber School of Arts and Sciences. After a lengthy re-visioning process, the Faculty of Agricultural Sciences is re-named the Faculty of Land and Food Systems “to better reflect the diversity of its academic programs and research initiatives”. Official launch of revised vision document Trek 2010. (UBC-O) Formal transition of OUC to Okanagan College and UBC Okanagan. UBC Okanagan’s official opening ceremony is in September. (UBC-O) UBC and the Okanagan Nation Alliance sign a Memorandum of Understanding. It established a formal relationship between the University and the Alliance, recognized that the UBC-O campus was located on traditional Okanagan territory, and authorized joint initiatives for First Nations higher educational programmes at UBC-O. The agreement would be renewed in 2012. Dr. Stephen J. Toope is appointed UBC’s twelfth president. (UBC-V) UBC signs Memorandum of Affiliation with the Musqueam First Nation. Similarly to the agreement with the Okanagan Nation Alliance, it established a formal relationship between the University and Musqueam, recognized that the Point Grey campus was located on traditional Musqueam territory, and authorized joint initiatives for First Nations higher educational programmes at UBC. (UBC-O) Dr. Doug Owram is appointed UBC Okanagan’s Deputy Vice-Chancellor. (UBC-O) First Convocation ceremony at UBC Okanagan. (UBC-O) UBC alumnus and Canadian diamond-mining pioneer Charles Fipke donates $6 million to UBC Okanagan for a new centre for innovative research. (UBC-V) Official opening of the Irving K. Barber Learning Centre. The Learning Centre houses UBC Library collections (including an automated storage and retrieval system) and reference services, as well as the Chapman Learning Commons, the Chung Collection, and the University Archives. It also includes lecture halls, classrooms, meeting and study spaces, and seminar rooms to support UBC’s interdisciplinarity and information studies programmes. UBC’s renewed strategic plan — Place and Promise: The UBC Plan — is launched in November, in a comprehensive public relations campaign utilizing print, broadcast, and digital media. (UBC-V) UBC is one of the host sites for the 2010 Olympic and Paralympic Winter Games. Events are held at the Doug Mitchell Thunderbird Sports Centre, and UBC Robson Square is leased as the site of the International Media Centre — both facilities are improved and enhanced as post-Olympic legacies for the University. (UBC-V) The Beaty Biodiversity Museum is officially opened, bringing together UBC’s various zoological and botanical collections in one facility, providing a new home for the University’s biodiversity researchers, and featuring Canada’s largest blue whale skeleton exhibit. (UBC-O) Campus doubles its land area with purchase of 103.6 hectares (256 acres) of land from the City of Kelowna. (UBC-O) Okanagan Aboriginal Centre officially opens as an academic and cultural space for Aboriginal students. “Start an Evolution” fundraising campaign launched at UBC-Vancouver and UBC-Okanagan. 14 First Nations languages are approved for UBC admission language requirements. 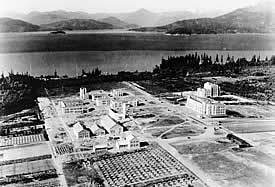 UBC grants honorary degrees to Japanese-Canadian students who were unable to complete their university studies or missed their graduation ceremonies when they were sent away to internment camps in 1942 (see above). (UBC-V) Department of Economics becomes the Vancouver School of Economics, within the Faculty of Arts. (UBC-O) Arts and Sciences Centre building officially opened. The 7,800-square-metre (84,000 square feet), four-storey structure houses classrooms, research and teaching labs, offices, student commons, and two large lecture theatres. (UBC-V) UBC purchases the Iona Building from the Vancouver School of Theology for $28 million, and moves the Vancouver School of Economics to the facility in 2016. Logan, Harry T. Tuum Est – A History of the University of British Columbia. 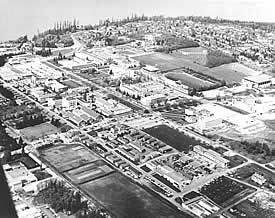 Vancouver: The University of British Columbia, 1958. Scrapbook for a Golden Anniversary – The University of British Columbia Library, 1915-1965. Victoria: Morriss Printing Company Ltd., 1965. UBC Alumni Chronicle / Trek. Woodcock, George, and Tim Fitzharris. The University of British Columbia – A Souvenir. Toronto: Oxford University Press, 1986.